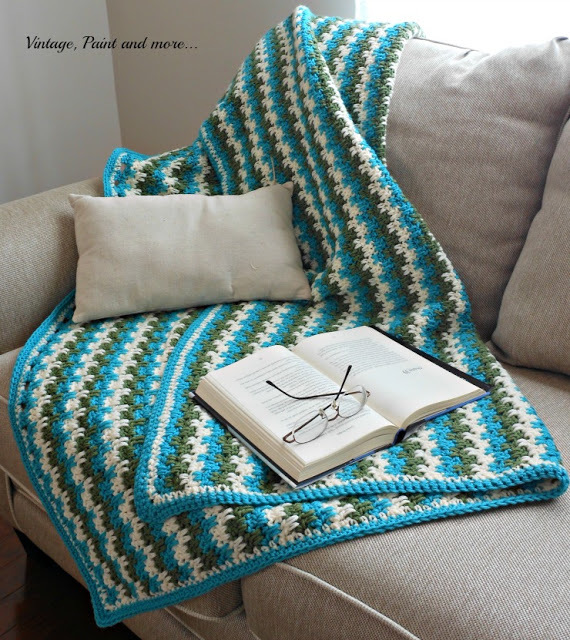 Today I would like to share an afghan with you that I just finished. It's a large crochet granny square afghan that is so simple a beginning crocheter could easily make this one in very little time. I love to make this particular pattern because it is so simple one - not fussy and a little plainer for those guys in our life. I made this one for my grandson. He loves to curl up on the sofa on these cool Fall afternoons and watch his favorite football team as they battle their way through another great game. The orange and white I chose are his favorite team's colors. There are literally a hundred different pattern variations to the granny square from quite fancy and difficult to quite plain and easy. ( Just go to Pinterest and you'll see what I mean.) I chose to use a very simple uncomplicated pattern since it was for my grandson and he is not really into anything fancy. 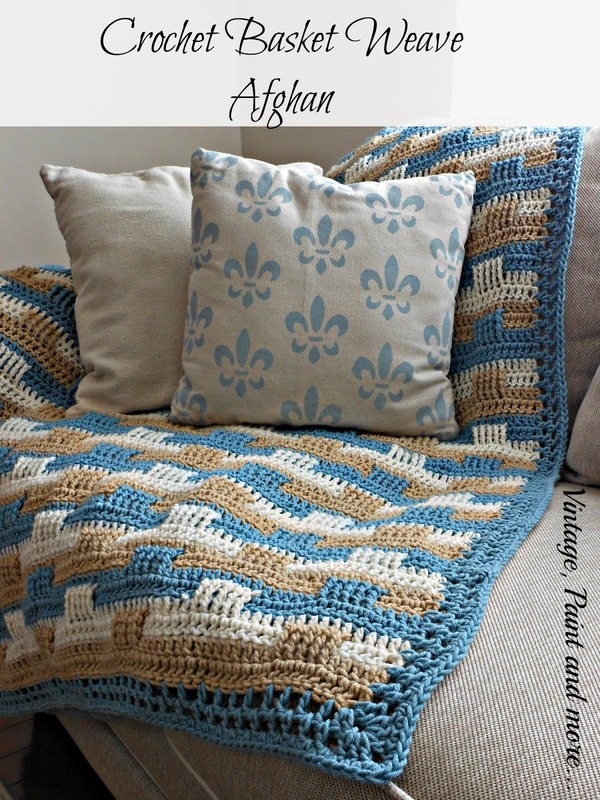 To make this afghan I simply started it like you would a regular crochet granny square using clusters of three double crochets with a chain between. I then just continued going around the square until I got the size I wanted. This one measures 71"x71". For the pattern I crocheted in one color until I thought it was aesthetically pleasing - then changed to the other color until I thought it was enough and continued in this manner. I did the colors in varying amounts of rows to give it more interest. 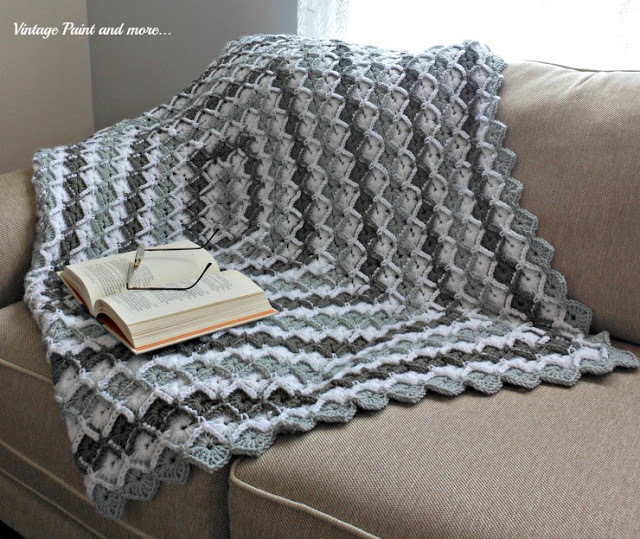 The border is simply two rows of single crochet in white. Here is a link to a tutorial for this particular granny square pattern I used. I used to use this particular pattern all the time to make quick and simple afghans because it can be adapted to any yarn, variation of colors and size quite easily. 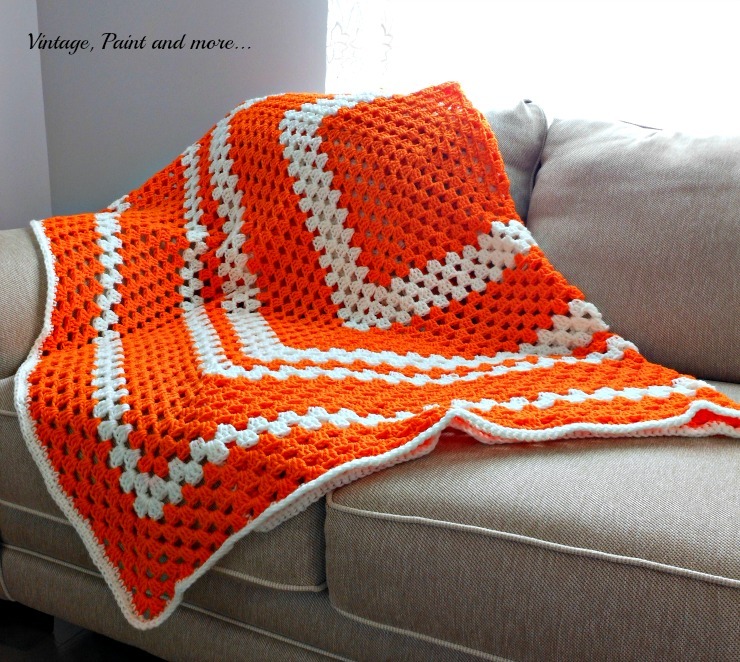 And, it makes such a nice, warm throw for those cool afternoons and evenings when it's time to watch the sports. The pillow shown here is a drop cloth pillow that I made with a stencil and sharpie markers. I taped off the stripes for a grain sack look and then stenciled the No. 5 in the center. These pillows are so simple and budget friendly. I will be showing you how to make a few in the a later post. 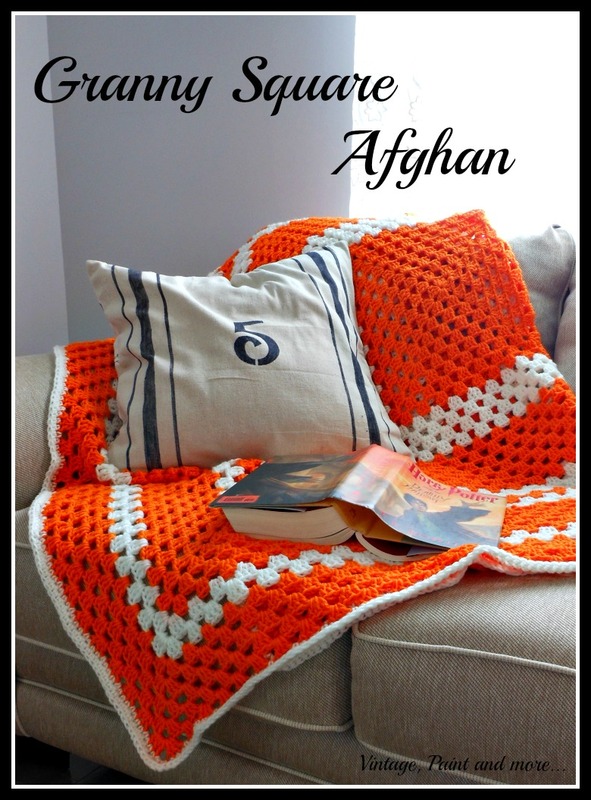 What is your favorite go to afghan pattern that you love to use? I love to hear from you so tell me about it in the comments below. I will be linking up to the parties that are found on the Where I Party. 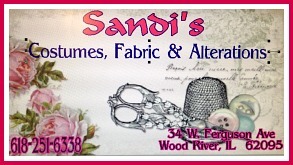 Please go by and visit them as I am sure you will find lots of creativeness and inspiration. I LOVE your granny square blanket. I make blankets using this pattern all the time and it's fun to make. I love the colors too that are just perfect for fall. Enjoy your day and have a Happy Halloween! Thank you. 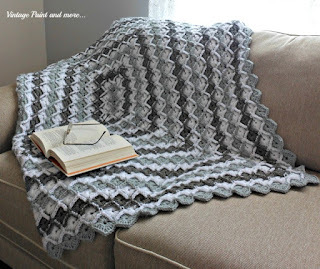 I love to use this pattern when I am wanting a quick and easy afghan. I love your choice of color for your blanket. Such an intense pure color and it really pops next to the couch. Oh, and I'm looking forward to your tutorial on the pillow. I love white and orange together!! You did a beautiful job crocheting this afghan!! Granny squares are lots of fun to make!! Thank you so much Keri - granny squares are fun to do. 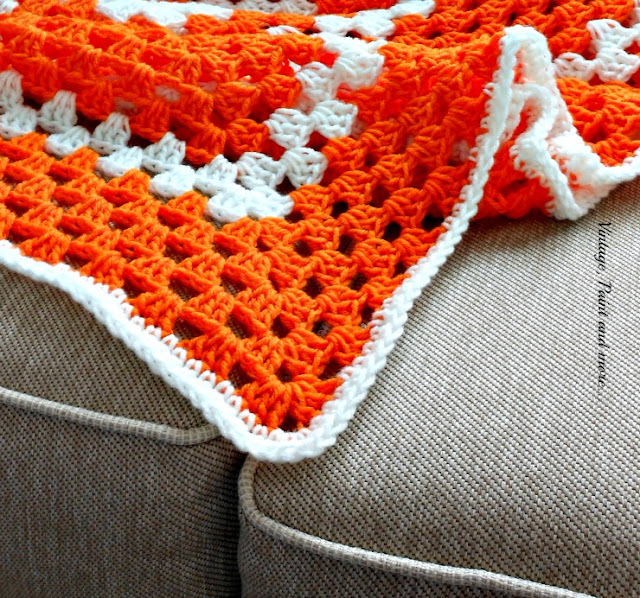 Great granny square afghan for your grandson!!! I love making simple afghans where you don't have to think too much! 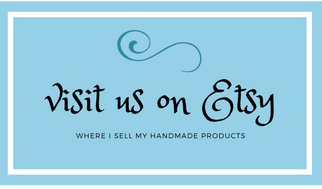 I took a peek at your other work, and they're gorgeous afghans! Have a great week! Thank you Oliva - I love to do challenging patterns but the granny is one I always return to - because it is such a simple afghan to make. What an awesome color for a boy. The granny squares has a really pretty texture. Thanks for sharing at The Creative Circle. Wow, is this a great idea. And I love the fact that it is so easy to do and can be customized to the favorite colors of you recipient. I used to make granny quilts and this makes me want to get the yarn out again and get started !!! Thank you Rebecca - I love making granny's because they are so simple and you can use your leftover yarns for it also. What a pretty Afghan! Love the color! Thanks for linking up to Merry Monday! Sharing on our MM Pinteret Board! Have a great week! 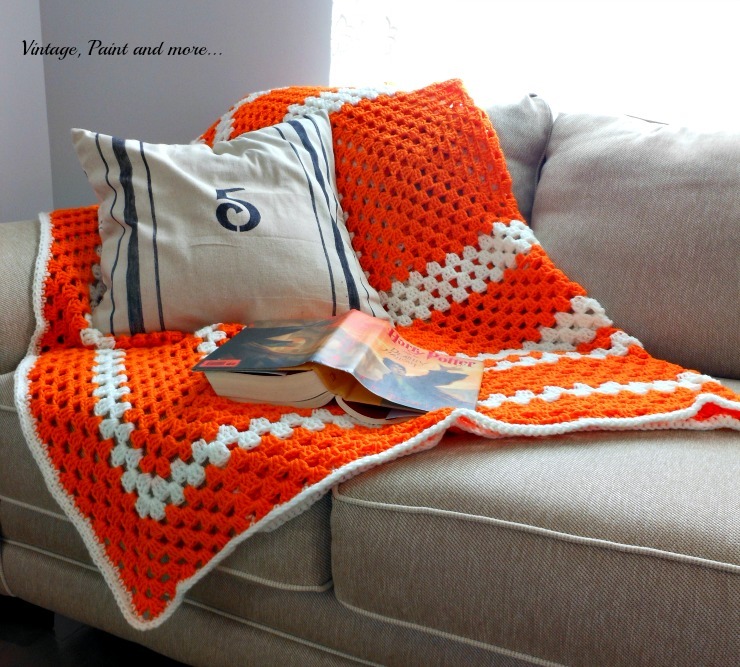 Love both the afghan and pillow Cathy! I love making grain sack stripes. Thanks for sharing with SYC. Thank you Jann - grain sack stripes are a passion of mine right now - love them. Beautiful afghan. The orange is so cheery! Cute afghan! Thanks for linking with Home Sweet Home! Carol, love your afghan! The colors are perfect for fall too! Thank you for sharing with us at the Brag About it Link party! 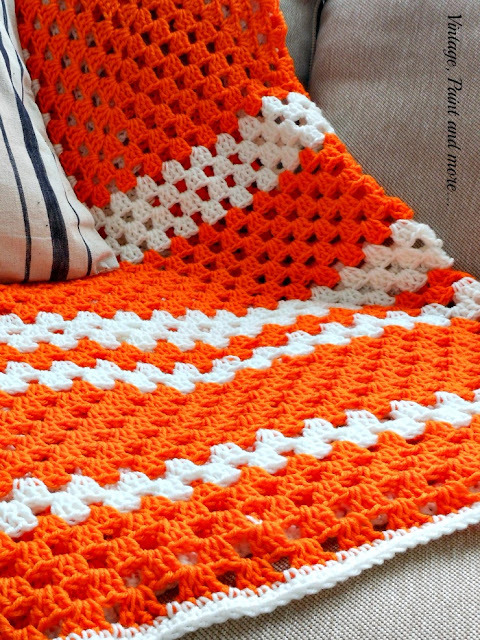 I love to crochet and this is perfect for Autumn - Thanks for linking up to Pin Worthy Wednesday, I have pinned your post to the Pin Worthy Wednesday Pinterest Board.